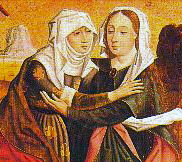 We remember today the visiting of Mary to her cousin Elizabeth and the wonderful prayer of the Magnificat. Verse: When Elizabeth heard Mary's greeting, she said: Response: "Who am I that the mother of my Lord should come to me?" Blessing Blessed be you, God of mercy and compassion, for you inspired Mary, the humble maiden of Nazareth, to visit her cousin Elizabeth and to assist her in her earthly needs. Help us, that following Mary's example we may remain always open to the needs and sufferings of others. Strengthen us with the nourishment of this meal, and bring us one day to love's eternal feast in your kingdom. Through Christ our Lord. Amen.